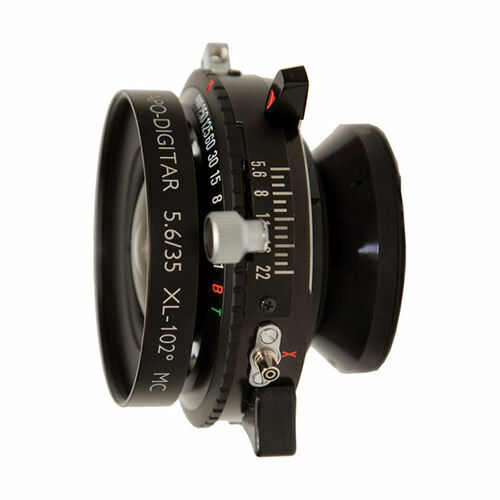 Lens Description: The Schneider 35mm f/5.6 Apo-Digitar XL Lens w/ Copal #0 Shutter is an extremely wide angle large format lens specifically designed for use with digital backs, which require extremely resolved, color correct image circles of a smaller size. Digital backs also benefit from use at larger apertures to avoid image degradation from diffraction, and this Apo-Digitar XL can comfortably be used at its maximum aperture at all times. This version of the lens is mounted to a conventional Copal #0 shutter.rnrnThis Apo-Digitar XL lens is recommended for use with backs as large as 37x49mm, and upon such backs it captures an image area similar to that of a 25mm lens upon a 35mm format camera. Its short focal length and wide 102° viewing angle are ideal for capturing tight spaces.